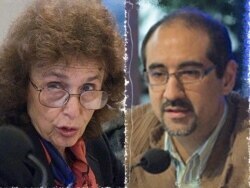 Haleh Esfandiari (left) and Kian Tajbakhsh, as seen on the program broadcast by Iranian state television (AFP) WASHINGTON, July 18, 2007 (RFE/RL) -- Against objections from human rights groups and the U.S. government, Iranian state television has broadcast a program featuring two Iranian-American scholars who have been detained and charged with crimes against Iran’s national security. The program, called “In The Name Of Democracy,” focused on U.S. citizens Haleh Esfandiari and Kian Tajbakhsh, both of whom have been jailed in an Iranian prison for several weeks. It aired at 21:45 local time on the Islamic Republic of Iran News Network (IRINN). A second part of the program is scheduled to be broadcast on July 19. The hour-long broadcast contained extensive footage of scenes from the so-called colored revolutions -- Ukraine's Orange Revolution, Georgia's Rose Revolution, the Tulip Revolution in Kyrgyzstan -- that led to the toppling of authoritarian governments. U.S. President George W. Bush was also shown praising revolutionary leaders while a narrator described the United States as the force behind the overthrow of governments around the world. The 67-year-old Esfandiari was shown first in the documentary, and appeared sitting on a couch with a bottle of water on a table in front of her. Dressed in the Islamic hijab, she described her duties as the director of the Middle East program at the Washington-based Woodrow Wilson International Center for Scholars. Her primary responsibility, she said, was to organize conferences led by prominent experts on Iran, many from Iran themselves. “When a speaker comes from Iran and speaks at a center as important as Woodrow Wilson, many people come to listen." Esfandiari defined "policy makers in Washington" as members of government institutions, the U.S. Congress, intelligence agencies, the media, nongovernmental organizations, universities, and research centers. At the conferences, she said, "a network was formed” of policy makers and scholars. The program was edited in such a way that her comments seemed to be shown out of order, and taken together, left the impression that she was making a confession. Tajbakhsh was shown in a similar setting, talking about his job as an urban planning consultant with the New York-based George Soros' Open Society Institute. "The fact that the U.S. administration gave money to the Soros Foundation reflects the fact that Soros and the United States share the same views on Iran," Tajbakhsh said. Iranian officials announced earlier this month that fresh evidence against the two had prompted its judiciary to launch more investigations into their cases. In Washington, State Department spokesman Sean McCormack condemned the program and described the government as “outraged” that two U.S. citizens were “paraded” on Iranian state television. "These people should be allowed to return and be reunited with their families immediately," McCormack said. "There is no reason to detain or in any way further harass these people." The broadcast was also condemned by many rights groups and prominent activists, some of which have accused Iran of detaining the two scholars for political reasons. Earlier today, Human Rights Watch called on the Iranian government to pull the broadcast from its schedule. Joe Stork, the group’s Middle East program director, said forced confessions are used by dictatorial regimes around the world to crush prisoners' spirits and scare citizens into remaining silent. Any words spoken during the Iranian broadcast, he said, cannot be believed. “We know that these individuals themselves have been held in almost incommunicado detention, they’ve not been able to see legal counsel, they’ve been only provided the opportunity to have very brief phone conversations with some of their relatives," Stork said. "So under the circumstances, these confessions have no validity whatsoever and we’re afraid that they would be used -- since the individuals are charged with various national security crimes -- that they might be used against them in some sort of legal proceedings to come,” he added. Mohammad Hossien Aqasi, a lawyer in Tehran, told Radio Farda that a forced confession cannot be used against someone under Iranian law. Esfandiari and Tajbakhsh are not the only Iranian-Americans being detained by Iranian authorities. Parnaz Azima, a journalist for Radio Farda, and Ali Shakeri, a founding board member of the University of California, Irvine, Center for Citizen Peacebuilding, have also been prevented from leaving the country and are facing criminal charges.